In January, President Donald Trump greeted the new year with an angry tweet about U.S. ally Pakistan. While the subjects of Trump’s tweets are often erratic, this one didn’t come out of nowhere. The Pakistan tweet followed just weeks after Trump unveiled his administration’s National Security Strategy – a document presidents have provided to Congress since the 1980s . 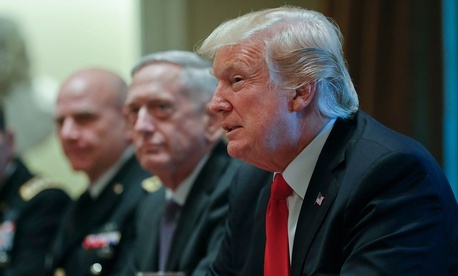 Indeed, it’s possible that the president’s bellicose tweet was inspired by this document – which also happens to be the first National Security Strategy ever shaped primarily by two generals. The office of Army Lt. Gen. H.R. McMaster, the national security adviser, coordinated the drafting of the document with the secretary of defense, retired Marine Gen. James Mattis. While military men have served as secretary of defense and national security adviser before, this is the first time both positions are filled by generals at the same time. I’m currently researching yet another general – Maxwell Taylor – who was engaged in comparable strategy reviews during the 1960s. Taylor was a former Joint Chiefs of Staff chairman, ambassador to South Vietnam and adviser to John F. Kennedy. Thinking about Taylor’s struggles back during the Cold War led me to approach this year’s security document with one main question: Could two military men succeed as the nation’s primary authors of strategy? The 2017 National Security Strategy, largely in keeping with its predecessors, does a good job at listing problems. It enumerates geopolitical and economic challenges from Russia and China as well as threats from Iran, North Korea and Islamic fundamentalists. It also points at military and other tools for addressing these threats. Despite President Trump’s dark picture of the world and his rhetorical emphasis on “ America First, ” a campaign theme he reiterated in an unusual presidential speech unveiling the document , it is not an isolationist strategy . It also doesn’t disavow globalism, the guiding principle of foreign policy for most of the past century. Its four pillars – protecting the homeland, promoting prosperity, securing peace through strength and defending American interests – echo themes found in National Security Strategy documents of the George W. Bush and Barack Obama administrations. McMaster described the new National Security Strategy as a sober accounting of current threats . Yet in this year’s document there is a marked absence of political objectives – like spreading democracy – which had been shared by Republican and Democratic administrations all the way back to Woodrow Wilson’s vision of a new world order after World War I . In this respect, it replicates a flaw already apparent in past decades: The National Security Strategy does not provide actual strategy, but rather guidance on drafting policy. Sound strategy goes beyond simple problem solving. It links means to ends in order to attain a broader political objective. This document also departs from predecessors in showing less pronounced faith in alliances and international agreements than what underpinned U.S. foreign policy since 1945 . While Mattis and McMaster appear to work well together, they have different views on the roles of soldiers in shaping strategy. McMaster made his name as a historian with a book on the flawed decisions that led the U.S. into the Vietnam War . He concluded that the Joint Chiefs of Staff were not heard, mainly because civilian leaders in the Kennedy and Lyndon Johnson administrations did not trust them. McMaster believed these military men had a better sense of how to win in Vietnam – or could have prevented the nation from getting involved in an unwinnable war effort in the first place. In a Dec. 18 PBS interview , when asked about his lessons from the Vietnam War, McMaster noted it was essential to present the president with all available options. Mattis, a history major and avid reader, has come to different conclusions about soldiers and strategy. In “Warriors and Citizens” , his 2016 book on civil-military relations, co-edited with Kori Schake of the Hoover Institution, Mattis notes that there was a problem with generals taking the lead in defining strategy because they are likely to view threats in isolation from a wider context and end up devising a depoliticized strategy. Secretary of State Rex Tillerson, who should provide a counterweight to a military-driven strategy, appears to sit on the sidelines. No other major actors on foreign policy have emerged from within the Cabinet or Congress. Even though some pundits have welcomed the steadying role played by generals in a mercurial administration , this influence could also be seen as representing an imbalance in civil-military relations that threatens to pull the armed services into the partisan maelstrom . So how did the military men do? They may have softened the president’s desire for unilateral action and kept open the door for more international cooperation. McMaster has lauded Trump’s unconventional approach that forced him to reconsider dogma . But this approach, in my opinion, threatens to destabilize a world order largely upheld by the United States, the premier military and diplomatic power since World War II, and one that boosted the American economy to unprecedented heights. Strategy ought to be the process wherein policymakers and soldiers link operational plans and capabilities to policy objectives. Instead, over the past decades, soldiers have relied overly optimistically on military strength. Civilian leaders, meanwhile, have misidentified policy guidance as strategy. Neither can deter or defeat the threats facing the nation by itself.